The Korea Blog recently approved its second batch of Worldwide Korea Bloggers and www.goneseoulsearching.com has been selected! 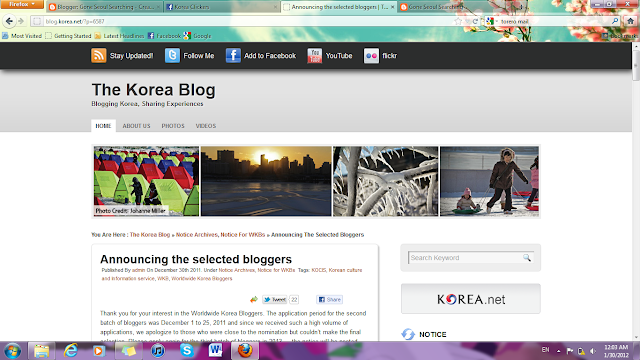 To see the recently announced list of World Wide Korea Bloggers (WKBs) visit the link here. I'm very happy to announce that my blog has been chosen by The Korea Blog to have the opportunity to share more about Korean culture with the world. I have gained so many opportunities and insights into the world through this blog and I hope to continue posting actively from my home town in San Diego, California. Please continue to share your thoughts with me and other readers and if you are interested in a guest post don't hesitate to send me an e-mail. o have their blog posts introduced on the Korea Blog. We post a new story every day, publishing stories from Worldwide Korea Bloggers about three times a week or 12-15 times a month. o receive gifts and a total of about five of the most active bloggers will be invited on a press tour of Korea for 3-4 days and continue blogging for the Korea Blog. Here is a list of bloggers — both who will continue from the first group and the newly selected bloggers. We will notify successful candidates by email in the first week of January 2012.